If you're going to invent an entirely new business category--say, e-commerce in China--it helps to have tunnel vision. 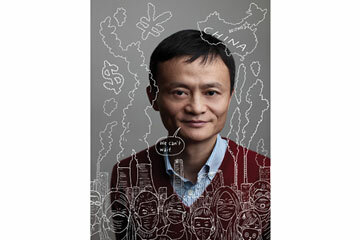 For years that's how Jack Ma saw the world. A former English teacher turned digital entrepreneur, Ma founded Alibaba in 1999 and built it into an e-commerce juggernaut that's bigger in mainland China than Amazon and eBay put together: its 2012 sales topped $150 billion. Ma became a billionaire, made the cover of Forbes and was named to the TIME 100 list in 2009. Things were good for Alibaba and for China, which saw its economy boom and hundreds of millions of people lifted out of poverty--thanks in no small part to the efforts of entrepreneurs like Ma. But as entrepreneurs get older--Ma, 48, says he is "old for the Internet"--they start to slow down, look around. What Ma saw was a country paying an environmental price for rapid development. His father-in-law developed liver cancer, a disease Ma--and some scientists--connects to the terrible water pollution that is now common in much of China. Ma saw the skies in Beijing and other Chinese cities grow foul with pollution. On a trip to the countryside near his hometown of Hangzhou, he saw that a lake in which he had nearly drowned while swimming at age 13 now barely came up to his ankles. Farmers told him that they were so afraid of the poisoned soil, they wouldn't eat some of their own produce. "I knew something was very wrong," Ma told TIME during a recent interview in Santa Monica, Calif. "This is serious--and we have to make people pay attention to it." Now Ma is making it his mission to get China to pay attention to its environmental mess. On May 10, he stepped down as CEO of Alibaba, though he'll retain a strategic role with the company. The next day he took a new job, as chairman of the China board for the Nature Conservancy (TNC), one of the richest environmental groups in the world. TNC has generally been U.S.-focused, but the sheer size and influence of China ensure that global environmental and climate issues will increasingly be decided there. If China is going to change for the greener, it will need local champions. Ma has volunteered. In the West, environmentalism has always been a grassroots cause, but it's also had the support of a cadre of the very rich--think Ted Turner with his buffalo preserves or California billionaire Tom Steyer's financing green political candidates. In China, the emergence of a superrich class is relatively recent. Now there are more than 300 billionaires in China and Hong Kong, and the wealthy could drive social change if they ultimately decide to follow the example of megaphilanthropists in the West like Bill Gates and Warren Buffett. "We all know how important it is to have Chinese leaders in this effort," says Mark Tercek, TNC's CEO. "So you can imagine how important it is for us to have Jack Ma in this."